This is not a step down from turbo related phenomenon. It’s about what the battery indicator does as a function of cell voltage, and on what level of output you are. The battery indicator should be blinking blue below a certain voltage, but remains solid when in turbo. It’s supposed to be blinking too. I know my order was shipped 2 weeks ago. I have the tracking number. How do I track it? Where do I go? I guess you open the google, paste the tracking number, then search..
You can use this one for example. Thank you. I didn’t know it’s coming from the Netherlands. Is Charger going to ship out soon? I hope so, but I do not know. Perhaps Terry knows more. This is not a step down from turbo related phenomenon. It's about what the battery indicator does as a function of cell voltage, and on what level of output you are. The battery indicator should be blinking blue below a certain voltage, but remains solid when in turbo. It's supposed to be blinking too. If you are in Turbo at cell levels low enough to already be giving a warning, then chances are you are also kicking it back into turbo past the 55 degree C stop down. (Not saying you are just that there is a good chance of it with most) It will allow you to bypass that feature including any power requirements needed. That I am aware of it will not flash at all in turbo. If the cells are already low enough begin flashing, then you are below any level that should be attempting to hit 15 to 16 thousand lumens. So when I said it will allow you to keep kicking it into turbo until you either can’t stand the heat or you kill your cells I meant that literally. It was designed to use turbo ay anytime… And if you are getting a blue flash you are between 50 and 9 percent. Why try to go to turbo once that warns you that you could possibly be as low as 9 percent already.. This would mean it is time to stop and charge or change the cells. 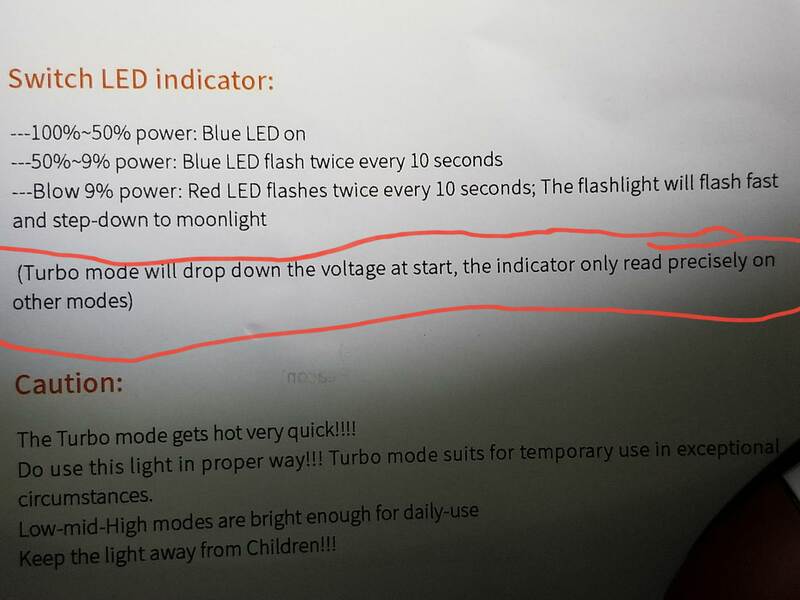 The instructions even tell you that it will not ready correctly in turbo. Nothing will ship out until after the Holiday.. I will ask for a more detailed answer later when I talk to Dale.. I see. I thought it meant voltage readout is not accurate due to voltage sag on turbo (high current). Alright then. Does the term “ alarmist “ mean anything to you ? Pushing far enough to go all the way until it actually turns red and steps down to a moonlight mode should only be in a serious situation and you have no other choice. It should not totally kill your cells, if it reaches that point no other mode can be used because the cells are too low. Hey guys, I’m very late to this thanks to my work schedule. Any chance I can still get one of the Navy Blue XHP70.2 versions? Ask Terry – the post directly above you. He makes the sales for the US. If he got one, he will sell it to you. - in the beginning of February the first lights have been sold by retail – the result for the 70 is as expected (a little below spex as usual in the flashlight business, but the babe is a real a$$-kicker), but the one for the 35 is bad – less than 50% of the formerly defined lumen. - the 35 with “21K” at the end is below 50% of the specified lumen. Those lights are actually sold by distributors for much less than the list price with an actualized lumen value. - other versions with “24K” seem to be in the market, but no measurements up to now. So: feel free to discuss all of these points in this thread and let us know what you think. Terry any idea when u are getting some MT09R 35 to test ? Since the main business of the 35 version is throw, why not post some lux readings? Are others discovering thermal step down doesn’t work? But it’s mostly posted in the GB-Thread, so it get’s lost in between many other posts. .. So far most people who test it say it doesn’t do what it’s supposed to be doing; the light gets too hot. Guys, I want to echo the sentiments expressed by arficus on this post. Personally, I feel the mods should have stepped in several times when people are being labelled in a negative way. I followed the other GB thread very closely since its inception and even expressed interest in this light as I really would love to add a “super” high lumen flashlight to my collection. But in the end, I chose not to proceed as >US$100 is a lot of money (my most expensive flashlight is the US$40 BLF Q8!) for me to fork out for a flashlight that noone has any real exposure to. TBH, I am glad I bailed since I am just an amateur when it comes to flashlights, and although I do have an electronic background and has done some soldering in the past, I am not sure if I am up to the task of taking a flashlight apart to replace driver/other components etc. Anyway, this is just a post to say that I appreciate the tough questions you ask, and the inputs you provide. At no point, do I feel any of your posts to be offensive or deliberately negative. Cheers and Happy Easter from Down Under. You really need to have followed all the related threads to have a proper understanding of what is going on. Thanks a lot for your support! And a happy Easter to you too! Apart from this thread and the GB thread on the Haikelite MT09R, are you saying there are other threads? I am rather OCD in terms of reading posts, so I do and have been reading every single posts on both threads. I am tossing up between getting this light or the older Astrolux MF01 as my next light. I’ve got the MF01 too, the 219C version. Both are truly amazing lights, but once the MT09R has a solid TA driver then the Haikelite is the clear winner. Thanks, that is what I thought too after seeing all the recent posts by TA. I wasn’t so sure before that. I have read the other two threads as well. I have just forgotten that they exist as there aren’t as much updates on those two threads. All the updates seems to be mainly on the GB thread. OMG! This light is now a work of art after the Texas Ace upgrade/mod! Was just out in a field blasting 4000k 80cri’s…awesome tint (everything is brown here right now…took it up against another 9000lumen CW light I have and this thing had way more throw and the tint a nice natural yellowish, while the CW was certainly stark white and blueish. Could definitely tell Texas Ace’s light with its tint was a better light up than the cool white. CW was kinda washed out, glarey…while the 70.2 4000k 80CRI was much much brighter, but didnt seem to throw any glare. Almost a magical tint compared to some CW’s and NW’s I have. It almost did appear 3x brighter…if one can even see that…it certainly had way more throw and filled up a much bigger area of the field and trees I was at. Thanks again Texas Ace for this upgrade…it is quite amazing! Be nice if Haikelite was putting these out for less than the $250 it cost me (base plus upgrades). If they could guarantee they were making the light Texas Ace sent me…they would knock it out of the park and light up the forums. Its like an insane Q8 now! Ramping is perfect speed, and its so reassuring to watch it obviously step down as it gets too hot. Second this – I got mine from TA about two weeks ago. It’s insane. I got NW 70.2 emitters, the tint is great and his Narsil UI is amazing. MT09R with new driver is rated at 21000 lumens. I think so Mr. Kangaroo… In the meantime I’ll just enjoy the MT09R with the stock driver.